Above are two cool women with a dream to produce wine in Walla Walla Washington. Annette Bergevin and Amber Lane formed Bergevin Lane Winery. Established in 2002 by two friends pursuing a shared dream. Bergevin Lane Winery nurtures wines that embody the truly unique environment of Walla Walla, Columbia and Yakima Valleys and the distinct single vineyards from where the rich terrestrial wines come from. I tried two new vintage releases from Bergevin Lane tongiht. 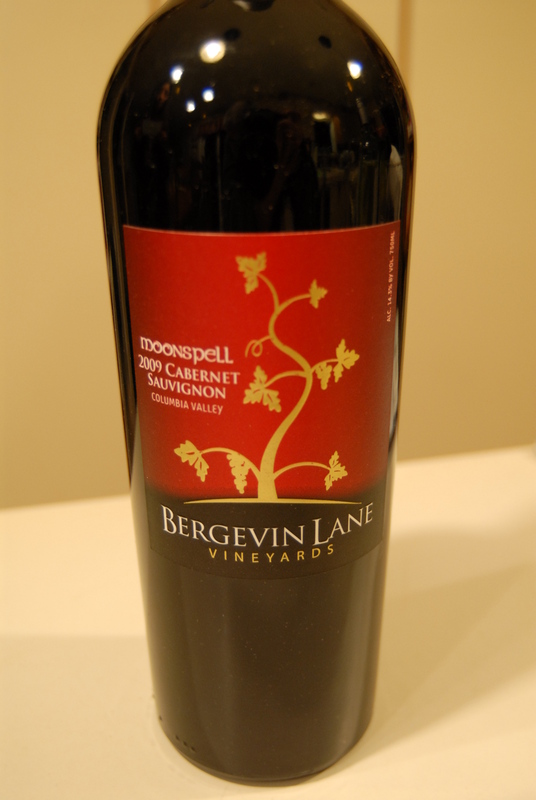 Above you see the 2009 Bergevin Lane Moonspell Cabernet Sauvignon. The Wine is a Bordeaux Blend but contains over the legal limit to be called a Cabernet Sauvignon. 76% Cabernet Sauvignon, 11% Merlot, 9% Malbec and 4% Petit Verdot (Folks who know me personally, know Larry The Wine Guy Loves The P.V.). They age the wine for 20 months in mostly French, American and a touch of Hungarian Oak. I think I learned during my trips to Italy, that you can’t make good pizza without a good dough, a good sauce and a good chef. The ladies feel this way about their wines. You can’t produce a good quality wine if you don’t have good grape juice. I think they are using grapes from the finest prime A.V.A’s (American Viticultural Area) Their fruit for this Cabernet comes from the famous Stone Tree Vineyards in the Wahluke Slope, Double Canyon Vineyard in the Horse Heaven Hills, Les Collines and Pepper Bridge Vineyards in Walla Walla. Now they need a good chef. Dave Harvey joins Bergevin Lane with over 19 years of winemaking experience in Washington State working for notable wineries such as Townshend Cellars, Gordon Brothers and Terra Blanca. With about an hour of breathing time, I evaluated the wine. Right off the bat on the nose, I knew I had the best of both worlds. New World wine meets Old World wine. Aromas fill my nasal cavity with Dark Currant fruits, floral notes (That comes from the P.V. Petit Verdot) and fresh berries with a dash of cigar box and earth. The wine hits you right on the attack with Deep Cassis Flavors, crushed flower petals, dark chocolate and vanilla notes and a nice long slightly peppery finish. “Where’s The Beef”? Retail Price $29.99. Col Solare from Antinori and my good friends at Ste Michelle is one of my favorite wines in the world but at least double the price of this effort. I can see why Dr Jay Miller who covers the Pacific Northwest Beat for Robert Parker’s Wine Advocate is so hopped up on this young winery. This Cabernet Sauvingon can play ball with the best of them at 1/3 the price. On to the Syrah. Above is the 2009 Bergevin Lane She-Devil Syrah. 99% Syrah and just 1% Viogner. Only 444 cases produced. Once again they are using the Stone Tree Vineyard from the Wahluke Slope and also 29% from Francisca’s Vineyard in Walla Walla. I have said this for years in agreement with the Beverage Director of The Bellagio Hotel In Las Vegas Jason Smith, “I will take a Washington State Syrah over most anything produced in the Northern Rhone Valley Of France”. In addition after taking my first whiff of this wine, I defy ANY Master Sommelier to blind taste this wine and not mistake this wine for a Crozes Hermitage or Cornas. The color is amazingly inky and dark, dark purple. The nose smells smokey like the Rhone, The darkest black fruit aromas mixed with beautiful cedar box spices and violets seduced me into a Walla Walla Coma!. On The palate a very Lush, Chewy texture that totally embraced my mid-palate and finished with Dark Cacao and Spice with a finish that sails on. I have paid $80- $100 for Syrahs on the internet from Walla Walla that don’t even come close to the quality of this wine. Retail Price on this one $26.99. 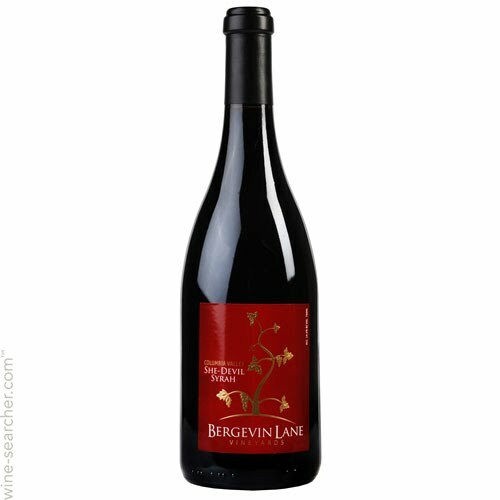 I love Cayuse, Charles Smith, K Vintners, Bob Betz Family Winery but I am going to go out on a limb here and say that this 2009 Bergevin Lane Syrah for this price is the best quality Syrah that I have tasted from anywhere including France in years. I don’t like to score wines but I am still finishing my glass from the bottle that has now been open 2 hours and I would have to go beserk and score this effort 96 points and a must try wine. I would love a pork tendeloin or rack of lamb with this. This wine is so good, I might even have it with a peanut butter and jelly sandwich lol. For a winery that only has been doing this since 2002 my hats off to Annette Bergevin, Amber Lane, Dave Harvey the winemaker and Gary Bergevin who joined the team as one of the Managing Partners in 2002 but was director of Canoe Ridge Vineyards since 1972. This is only the Beginning. This is what value driven wines USED to taste like in the 90’s from Napa and Sonoma. This is what value driven Bordeaux and Rhone wines USED to taste like. For $30 and Under Bergevin Lane provides a trip down “Memory Lane”. Wait, one last swallow of the 2009 She-Devil Syrah….WOW, good to the last drop! Nice meeting you Wednesday evening. Really glad I ran into you. I am here in Miramar, Florida just for the week working at Memorial Hospital. Meeting you was one of the best parts of my trip. Especially because you introduced me to the She-Devil Syrah from Bergevin Lane. You are spot on about this being a fun drinking wine that is surprising in it’s complexity yet compellingly pleasant. That inky purpleness had the Maitre’d at Cordon Bleu asking me what this wine was! I paired it (after a few glasses on Wednesday) there last night with a T-Bone of Lamb and it was truly exquisite. My hat is off to Amber and Annette and all the folks at Bergevin. I can’t wait to try more of their wines. Thanks again and enjoy your European adventure! At the time of this writing there were no reviews for this wine from the major magazines however, The 2009 She-Devil Syrah has scored 90 Points from Wine Spectator. I knew it when I tasted it! PreviousWines For Chillin’ And Grillin’ As Summer Approaches!